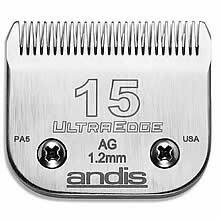 Andis #15 AG Ultra Edge Clipper Blade - Leaves Hair 3/64"
When used against the grain this blade gives a closer cut than the #30 blade. It produces a really nice finish on the top of the head and back of the neck of a densely coated Schnauzer, but the finish is too close for the Schnauzer bodywork. Works well on Terrier ears when working with the lay of the coat. Good blade to use when dealing with mats that are packed tight to the skin. Work of this nature must however be done slowly and with considerable care. It will easily skim the coat from the under belly and topside inside of the back legs on any breed. The size #15 blade is said to be one of the most versatile of dog blades, and is often a popular choice for many dog-grooming contests. - Kennel & Lamb clips: face/feet/tail. - Royal Dutch clip: face/feet/tail and a wider strip down the side and possibly the back. - For Poodles with sensitive skins use a Oster #10 for the face. The #15 blade is also used on the ears of the Airedale Terrier, face ears and part of the tail of the Bedlinton Terrier, the ears of the Cairn Terrier. For Cocker Spaniels it is used on the face, ears, throat and the head, the top of the ears of the Dandie Dinmont Terrier, the English Setter, Kerry Blue Terrier, and the ear tips of the West Highland White Terrier. In addition the blade is used on Irish Water Spaniels, Keeshond, Old English Sheep Dogs, Border Terriers and Yorkshire Terriers. A wide range of attachment combs can be fitted over these blades to provide increased cutting length. Comb attachments should only be used on well-groomed coats and not those, which are tangled or matted.